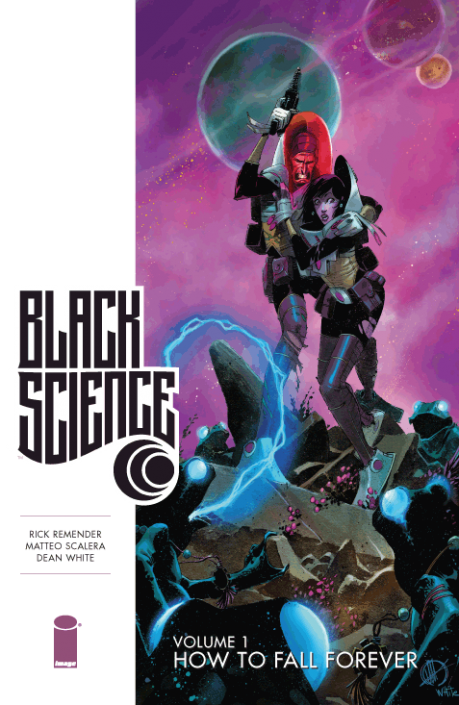 This Wednesday marks the release of Black Science, Vol. 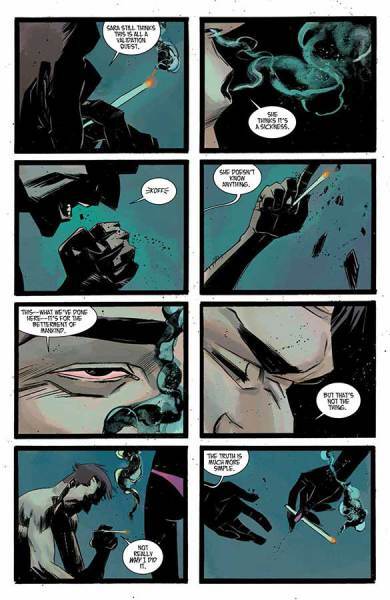 1: How to Fall Forever, which collects the first six issues of the highly acclaimed Image Comics series. For avid readers of Black Science, this article will read as an echo of your gracious thoughts on the series. For those who have not yet given this series a shot, you are truly missing out. 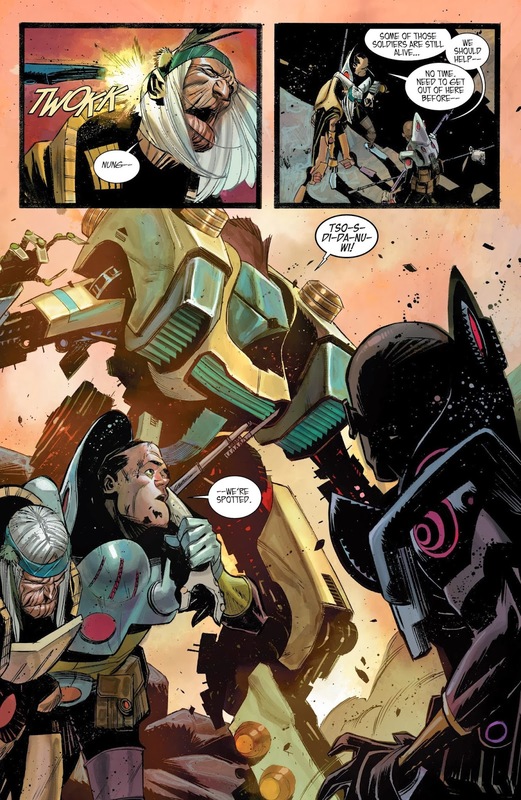 Writer Rick Remender, along with artist Matteo Scalera and colorist Dean White, creates an equally unique and awesome universe, or “Eververse”, in Black Science, making it a MUST PULL for any comic book reader. Everything. 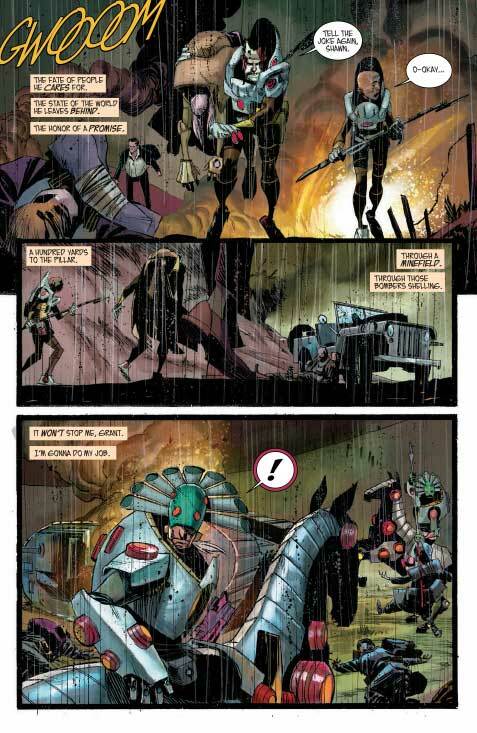 From the opening pages of issue one we’re introduced to an unimaginable plethora of otherworldly creatures – Frogmen , Large Turtles, Fish People, Futuristic Native Americans – whom all immediately pop right out of the page, thanks to the masterful art work of Scalera and White. 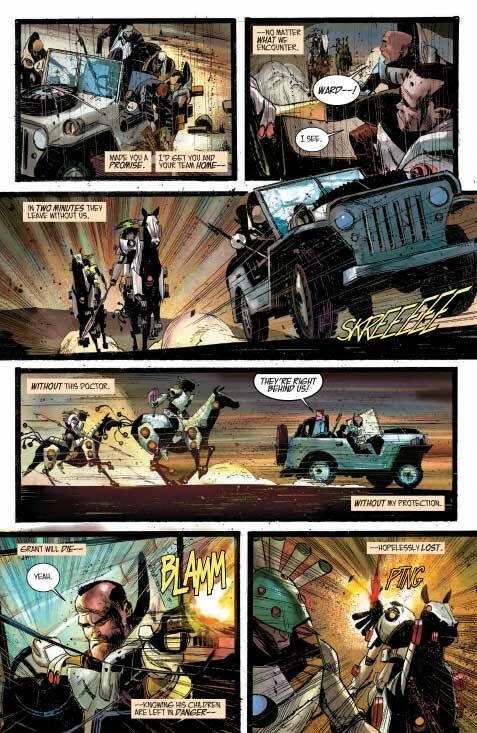 Right away we’re thrown into the action as we follow Grant McKay while he tries to make his way back to his children and his group known as “The Anarchist League of Scientists” (any geek who reads that has got to love it). This group of super cool/smart scientists continuously travels from one point of the Eververse to another (y’know… dimension hopping). Their dimension-traveling machine, called The Pillar, has been sabotaged, causing the group to be unknowingly thrust to a random place and time. Their only goal is to fix it and get back home, but the Pillar has other plans as it continues to “jump” to unpredictable locations at any given time. Reading Black Science reminds me of two things, filmmakers Spielberg and Nolan. Black Science has a strong sense of Sci-Fi originality while maintaining a realistic, non-campy approach. Readers truly understand who these characters are. A single issue may not spend it’s entirety in one world, the threats are real and constantly all around them. 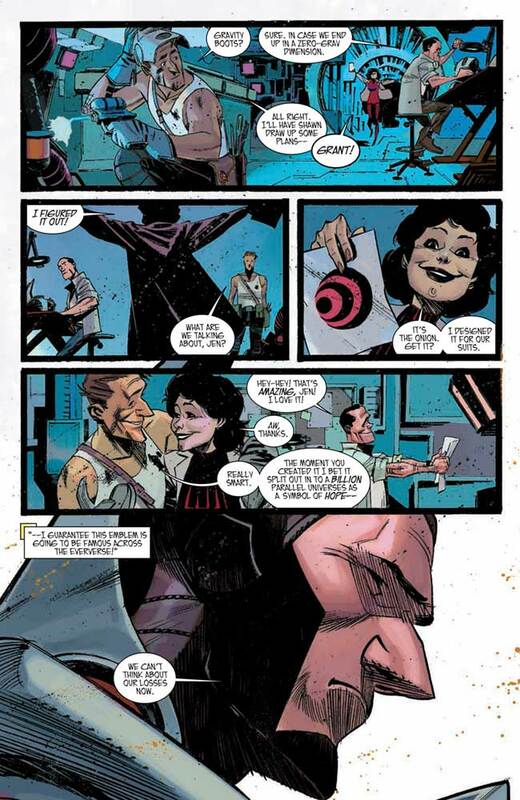 Remender forces the reader to care for every character, even the ones with little “screen time”. 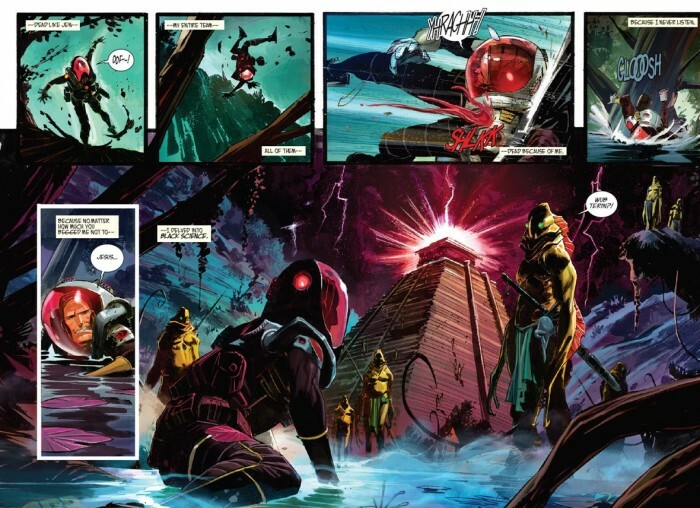 The most recent chapter of Black Science (Issue #6) is the most beautiful single issue to look at in recent months. It ends with a major cliffhanger no one saw coming, changing the perspective of the entire story, ensuring you that the adventure has only just begun. Nothing. Scalera and White consistently create worlds and creatures unlike anything I’ve ever seen. 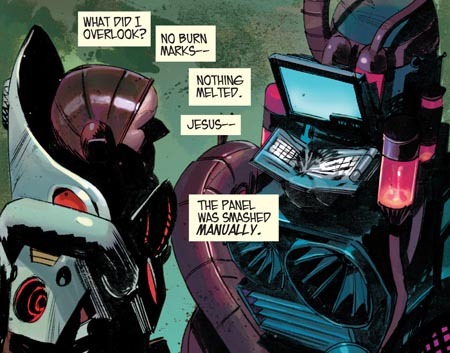 The eccentric (unreadable) dialogue Remender cooks up for these creatures is absolutely entertaining to read, even if I don’t understand a word they’re saying. It’s extremely appreciated that within these first 6 issues, not once did the creative team lose their touch. This is how comic books should be. If you aren’t reading Black Science, I highly recommend you jump on board when the first trade paperback, containing the first 6 issues, is released on May 28th. This is not a title you want to wait to read. You WANT to read it every month it’s released… it’s that addicting. The art alone is worth the cover price. Do yourself a favor and read this series.